Discontinued car resale goes downwards not upwards mate. I was also confused between these three cars as my daily mileage is about 100kms from home-office-home. after searching lots of threads now finalize wagon-r vxl due to mileage/km and its suspension and interior looks quite good. go for it. its we the people who will make it popular. I don't have a reason not to buy wagon-r if you have budget around 1 million. 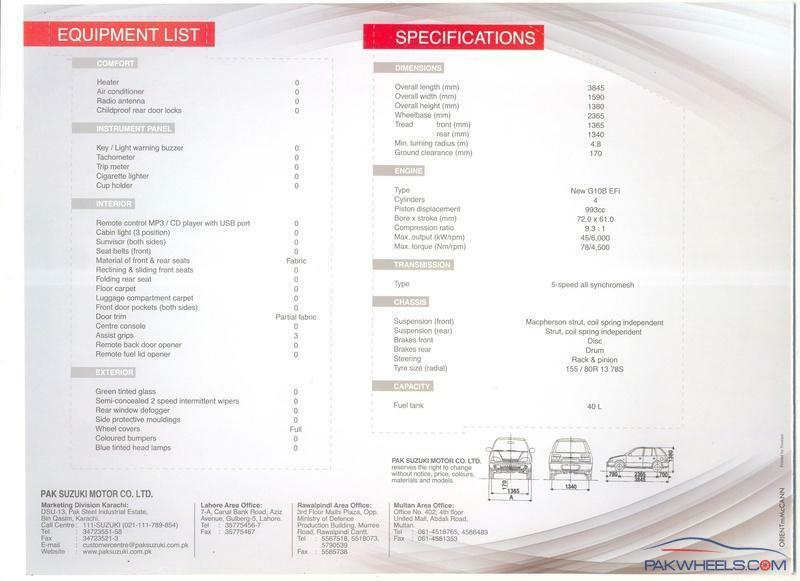 Top 2 options are Swift and Wagon R, I removed cultus because why do you want a car that is going to discontinue from pakistan in 2015 plus same shape and almost same engine one could get 14 years ago. Cultus is an old car meaning that parts will be available cheap and maintenance costs will therefore be low. However, it is a barebones car with mileage being midway between Swift and Wagon-R. I sat inside one and it is surprisingly spacious... or maybe it just feels that way. There was sufficient legroom for passengers sitting on the rear seats. Kind of like Santro with added space. You may also want to look at Faw V2, just in case you want value for money. Good fuel avg. , powerful 1.3 engine, Air bags, ABS, EBD, Power windows, Power steering, Alloys and imported tyres in 1049 only. I have test driven V2 and you can even read my review in its thread. Its parts are going to be expensive like Wagon-R. The only things bad about it are "Al-Haj FAW" and total lack of resale. I experienced the latter with Chery QQ in the past which sold quite cheap. Al Haj are an unknown to me and the market. Their reputation, parts availability and reliability are BIG question marks as of now and I wouldn't want to be the guinea pig. I felt Wagon-R's rear door area is a bit too slim. Not everyone may be comfortable getting in with such an upright entry position. There were grooves on top of Wagon-R roof. Does the car have a roof carriage for luggage as an accessory? If so, what is the cost? I felt Wagon-R's rear door area is a bit too slim. Not everyone may be comfortable getting in with such an upright entry position.There were grooves on top of Wagon-R roof. Does the car have a roof carriage for luggage as an accessory? If so, what is the cost? the rear door area is more than santro, moreover the doors open almost complete 90 degree, upright position with more leg space(than santro n cultus, talking about rear only) in wagon r makes it comfortable for passengers in long journey. lol to that, all new cars have smaller exterior dimensions but they are more roomy from interior. and wagon r is more comfortable with softer suspension and up right seating position(i can never decide how to sit in a cultus' backseat hence I get pain in a** and backbone on long drives). btw i'm 6'0 and own a cultus. I am only 5'10" and we had a Cultus till like 2 weeks ago, which we had kept for last 5yrs. I have driven it and also sat on all seats in all sorts or journeys over the years. We are currently also looking to buy a small (possibly) used car and have checked out the WagonR. Personally, that's not the feeling I got. If someone says WagonR is better build, have newer technology, has more features, etc. than I would believe him/her as there is no point in avoiding reality even if one likes/dislikes it. Usable/Relevant space, however, is another issue. I felt Cultus looks and feels more spacious. Its width also means 3 people will probably sit more comfortably. My point here is not to argue as it could be your own opinion. However, as the OP asked for advice, I feel that we should give him an honest advice and not our prejudice/personal likes/dislikes. Best is for OP to try out both and decide for himself which one is more suitable and if indeed rear leg space and width are of prime importance to him or not. What I mentioned is a fact which remains that Cultus is both more lengthy and wider than WagonR. Its hard to digest the fact that someone is suggesting a ride that is still in production after 12 years and is going to get discontinued this year.Being in this forum as people generally seek our advice we give them the right direction. Cultus was a good car but its era has to end,its resale will take a hit as its get discontinued so i would not in my right mind suggest buying a cultus.Wagon R is more fuel efficient than cultus.Hatch is a hatch.It has the same room for every ride i.e 2 peeps infront 3 in back.If you are looking for space then buy a sub-compact or compact car. Wagon-R has a better and efficient engine.Its resale will build up after the dicontinuation of cultus.Faw V2 is my preffered choice as i am not a resale savyy.I buy cars for commuting not as an investment. cultus is wider(but the rear wheel arches protrude in interior making it impossible to sit close to the door comfortably). and longer from outside(not from interior). and the low height of seats with tunnel for exhaust piping makes the one sitting in center of rear uncomfortable. there's always been a cultus or khyber in my use since 2005(i learned driving in 2008 when i turned 13), still have a khyber and gli 1.6 and IA a wagon r will be my next after fiscal year 2014-2015 is over. I went to a Suzuki dealership/showroom and had a look at all three options listed in title. As of now, I think Wagon-R makes a lot of sense. 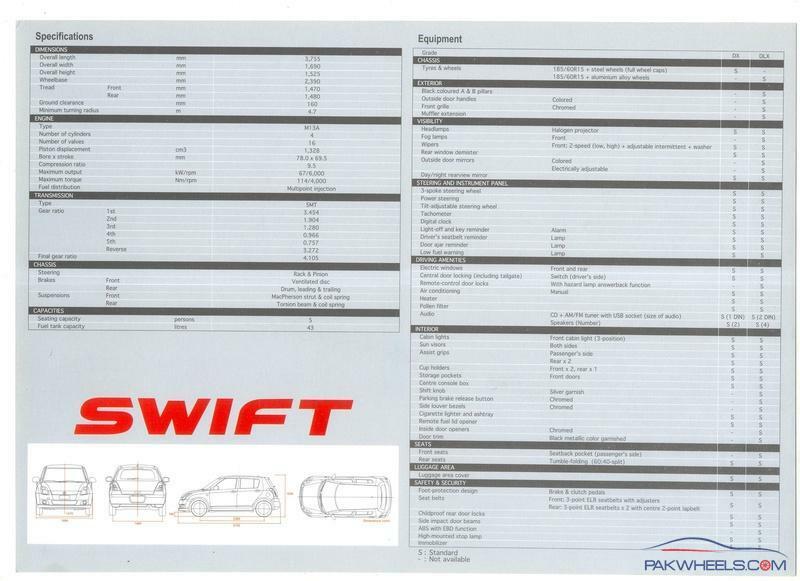 Swift is more expensive, has similarly expensive parts and low mileage. The only car better in around the same range is FAW V2 which has a lot of uncertainty surrounding its long term support and lack of resale. 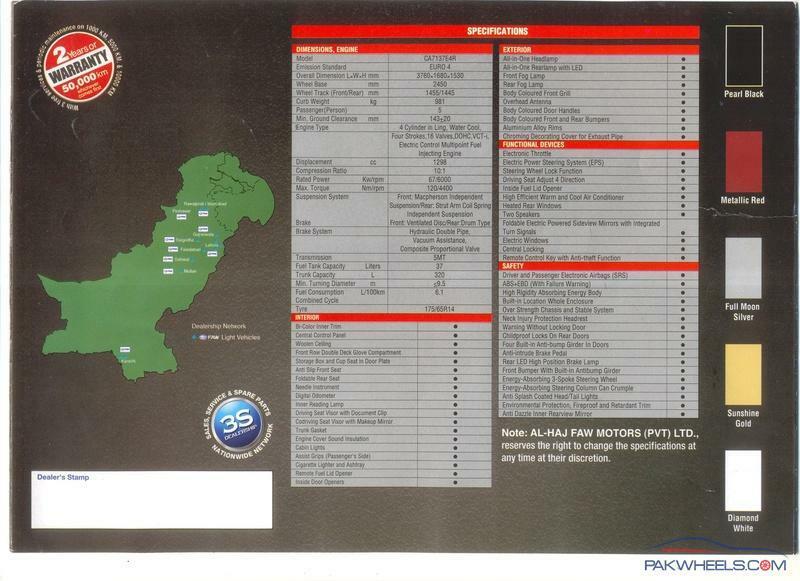 Here are some brochures for each of the cars which I got from showroom. 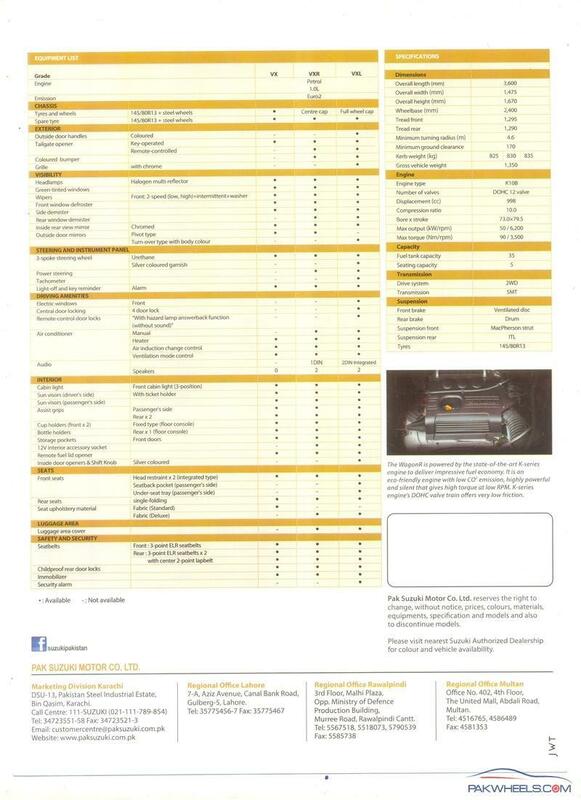 I hope it helps differentiate various cars on the basis of their features. Wagon R is better than all of these. Its engine is better and latest as compared to both. While interior and cabin space is good too. Moreover both Swift (the model here in Pak) and Cultus are outdated as compared to what the world is offering right now. But the 1000 CC version of Wagon R is the same in the world!. Its the best you can get in this price range. And those Who are saying its length is less as compared to Cultus, Come on! look at Cultus' longgg Bonut. Cultus is even more in length as compared to Swift. These kind of cars doesnt come in the world now. And after decades it will soon be outdated here too. And yes, If you can wait for Celerio, Its good too. It has same Engine as that of a Wagon R. So according to me go for Wagon R and if you have got some extra money, Swift is good too. You can also look at Pak wheels video review of both of these cars for details! 1 liter vrs 1 liter looks good. But 1.3 comparison not at all comes in comparison.